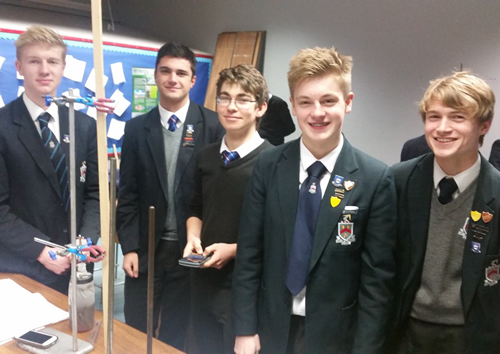 Each year, approximately 1600 of the most able physics students attempt the British Physics Olympiad competition. It consists of very demanding questions that require students to think beyond the constraints of their A-level Physics specifications. Ermysted’s has regularly taken part and has achieved considerable success in recent years. Some of you may remember that last year, one of our students, Joseph Krol, secured a place in the international Olympiad in Zurich, having achieved the very highest mark in the British competition. Joseph has gone on to study Mathematics at Cambridge University. This year, we entered five students in the competition, hoping for similar success and we haven’t been disappointed. Our results were a very impressive Gold, two Silver, one Bronze and a Commendation award. A special mention to Julian (above, middle) who not only achieved a Gold Award, but a mark that ranks him in the top 50 nationally and so he has progressed smoothly into Round 2 – another gruelling three and a half hour exam awaits. Good luck! (from left to right): Rhys, Fernando, Julian, Jacob, Tom.